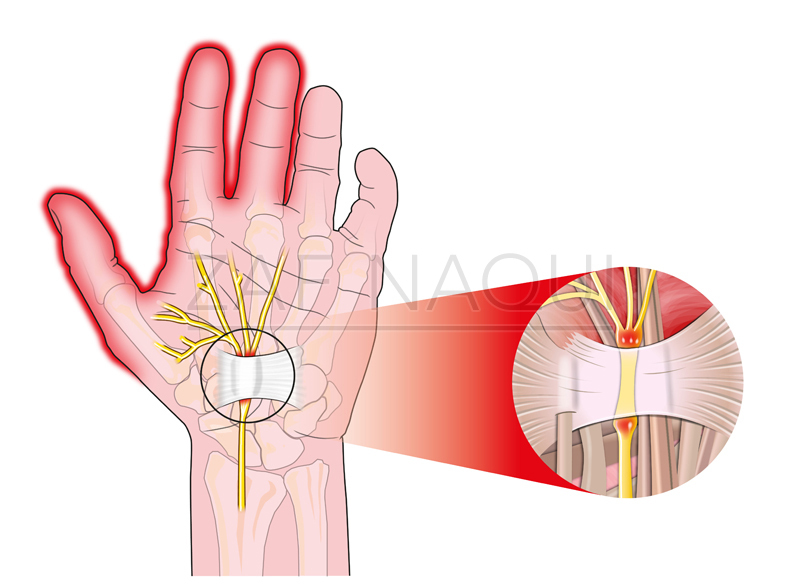 There are a number of ways that the nerve can be compressed at the wrist. Osteoarthritis and fractures at the wrist may cause the space around the nerve to be narrowed leading to the syndrome. 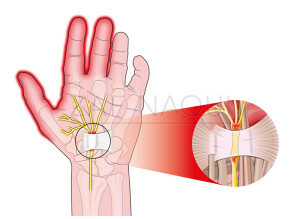 Inflammation of the lining around tendons lying adjacent to the nerve known as tenosynovitis is another possible cause. Other conditions associated with carpal tunnel syndrome are pregnancy, thyroid disease, rheumatoid arthritis and diabetes. However, in most cases there is no identifiable causative factor. The pain, numbness and tingling is usually within a particular distribution; affecting the thumb, index, middle and ring fingers, and is particularly noted during the night. In chronic cases, the muscles of the thumb may also be weakened leading to difficulties with maintaining a grip and fine movement of the fingers. Activities such as picking up coins and fastening buttons may become difficult. Following a consultation, involving a medical history and clinical examination, you may require X-rays and specialised tests of the nerves and muscles within your hand known as nerve conduction studies and electromyograms. Initially Mr. Naqui will attempt conservative measures such as splinting of the wrist and hand therapist directed exercises. Steroid injections can sometimes help reduce swelling around the median nerve. Persistent or severe symptoms are likely to require surgical treatment. Surgery aims to relieve any pressure within the carpal tunnel through which the nerve travels. It involves releasing a thick ligament, which overlies the tunnel. Mr. Naqui performs carpal tunnel decompression surgery at a number of hospitals around Manchester (see Hospitals page). The procedure usually lasts 15 minutes and is day case requiring only local anaesthetic. The surgical scar is usually in the region of 2 to 3cm long, and is located at the base of the palm. Taking simple painkillers such as paracetamol regularly for the first 2 days after the operation will help to relieve any post-operative pain. Finger and wrist exercises are commenced the same day. Stitches will be removed at 10-14 days after the operation either at your GP or at the hand clinic. You will be able to use the fingers of your hand the same day for light activities of daily living such as holding a utensil / remote control. If you perform heavy lifting at work it is advised to stay off work for 4-6 weeks; otherwise a period of 1-2 weeks off work is recommended to allow your wound to heal without undue pressure. You are not advised to drive for 1 week after surgery. A return to physical exercise and contact sports will be discussed and tailored to each individual, however most activities can commence after the wound has healed and activities involving heavy lifting and contact at the operative site can commence at 4 to 6 weeks. Carpal tunnel decompression is considered a reliable procedure with a success rate of about 90%. There may be an ache around the site of surgery that may last for weeks to months after the surgery and grip strength may take some time to recover. The original symptoms of pain, numbness and tingling may not completely resolve after surgery in a small percentage of patients. There are small risks (<1%) of infection and nerve injury.